CLEVELAND — The New York Giants passed on the quarterbacks in the 2018 NFL Draft, but this year, they are among the suitors for the top signal-callers in the 2019 class, namely Ohio State Buckeyes alum Dwayne Haskins. For the second time in a month, Haskins was featured on the back cover of The New York Post Thursday, this time after going through his paces at Ohio State’s Pro Day workouts in front of NFL scouts, coaches and decision-makers. According to Paul Schwartz of the New York Post, the Giants were well represented at the Pro Day, as coach Pat Shurmur, offensive coordinator Mike Shula, senior VP of player personnel Chris Mara, VP of football operations and assistant general manager Kevin Abrams and director of college scouting, Chris Pettit, were in Columbus to watch the workout. “He’s an impressive young man,” Shurmur told The Post. Earlier this month, Haskins was featured on the back cover in a Giants jersey after the New Jersey native answered questions at the 2019 NFL Scouting Combine about the prospect of playing for the home-state team. “Growing up in New Jersey, I grew up a Giants fan, so it would be a dream come true as far as being able to go back home where my family is and play for that great franchise,” Haskins said at the NFL Scouting Combine. “(They have) a lot of really great skill players. Haskins echoed those same sentiments after his Pro Day workout. “To be able to even be considered by New York, as a kid growing up as a fan, it’s just an extreme blessing,” Haskins said. Haskins’ professional prospects rose with his success in late-season games. On the way to Big Ten Championship Game Most Valuable Player honors, Haskins completed 34 of his 41 pass attempts for 499 yards and five touchdowns against one interception. Haskins’ 34 completions, 41 attempts, 499 yards and five passing touchdowns set new Big Ten Championship Game records. The 499 yards were a single-game personal best for Haskins, who eclipsed the 300-yard mark nine times and the 400-yard plateau on five occasions, including two of the last three games, and just missed the latter with a 396-yard showing against the Michigan Wolverines on November 24. Ohio State quarterback Dwayne Haskins passes against the Washington Huskies during the first half of the Rose Bowl Game in Pasadena, California on January 1, 2019. The 6-foot-3, 220-pound Haskins completed 348 of his 496 attempts (70.2 percent) for 4,580 yards and 47 touchdowns against just eight interceptions. Additionally, Haskins rushed for four touchdowns in his lone season as a starter. A first-year starter after sitting behind record-setting signal-caller J.T. 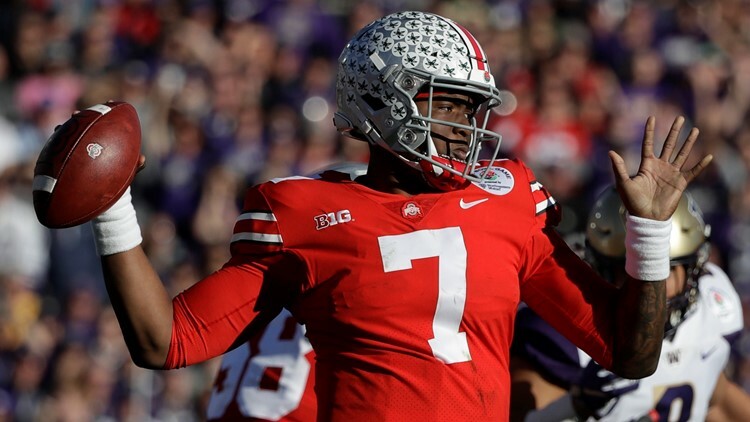 Barrett for two seasons, Haskins was the Big Ten Offensive Player of the Year, Quarterback of the Year and the Offensive Player of the Week a record six times in 2018. Among the records Haskins set in 2018 were the touchdowns responsible for (51) and total offensive yards (4,702).